You Are Here: Home » What is the Arborfield SDL? 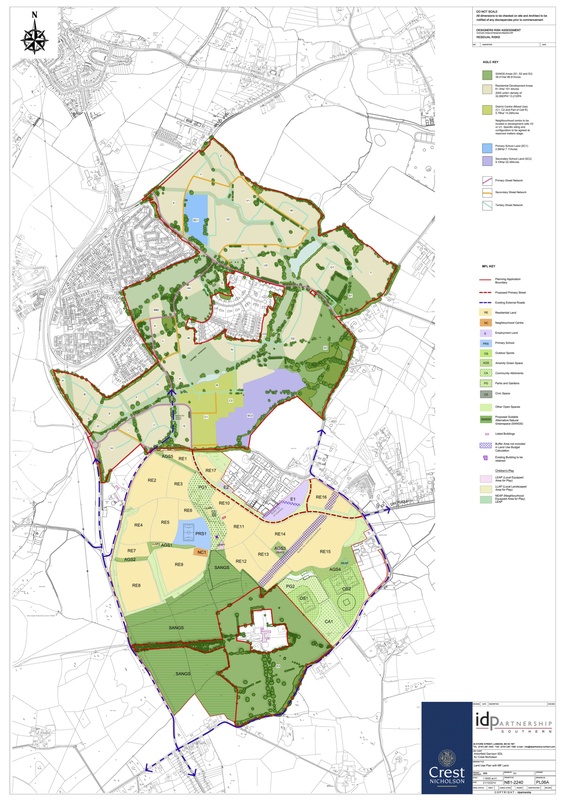 The Arborfield SDL is one of four strategic development locations defined by Wokingham Borough Council to take the bulk of new housing development in the borough over the period to 2026. The strategic development locations were adopted on 29th January 2010, prior to the last General Election, and despite the Conservative Party nationally urging councils to delay such decisions until after the election. Although promises were made during the election campaign, and despite top down targets being abolished by the new government the plan to build 3,500 houses around Arborfield Garrison remains. However the plans stalled when the new government abandoned plans to close the Arborfield Garrison as part of a review of the proposed move to a new base in South Wales, which was to have taken place in 2012. Subsequently the Ministry of Defence decided that the personnel stationed at Arborfield would be moved to a new facility to be built on the site of RAF Lyneham in Wiltshire, reversing a previous decision to close the facility there. 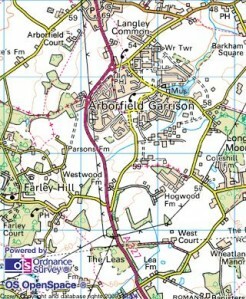 The date given for closure of the Garrison is now 2015, however the MoD have subsequently announced they will retain some of the housing on the Arborfield site due to there being inadequate housing available for personnel on other nearby bases. 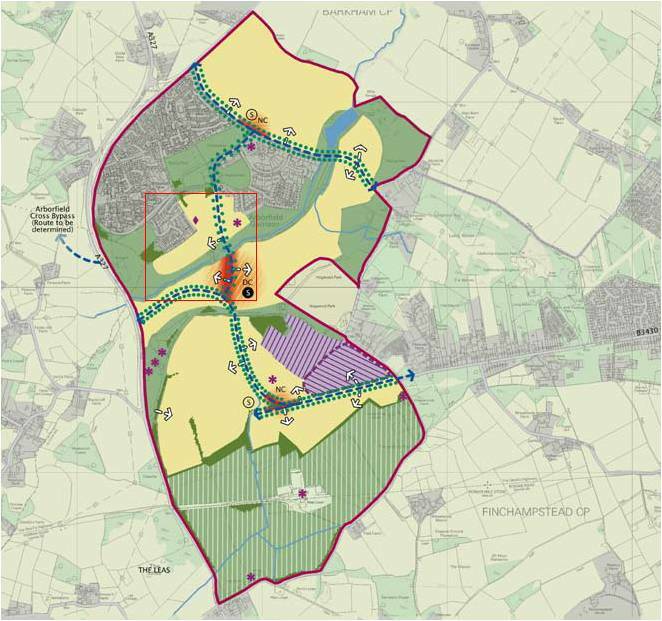 Because of the rural location of Arborfield, and the requirement to build a “sustainable community”, the development will consist of more than just the existing Garrison site. 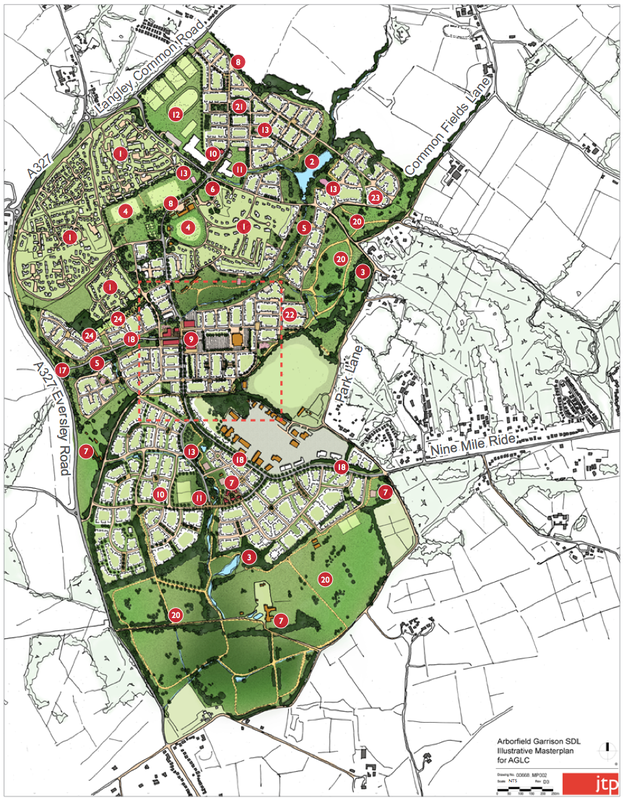 In addition the strategic development location includes a significant area of land belonging to other landowners to the south of the Garrison on the western edge of Finchampstead, extending as far south as Park Lane. Whilst the southern part of the area around West Court is designated as green space, housing will extend south of an extended Nine Mile Ride. 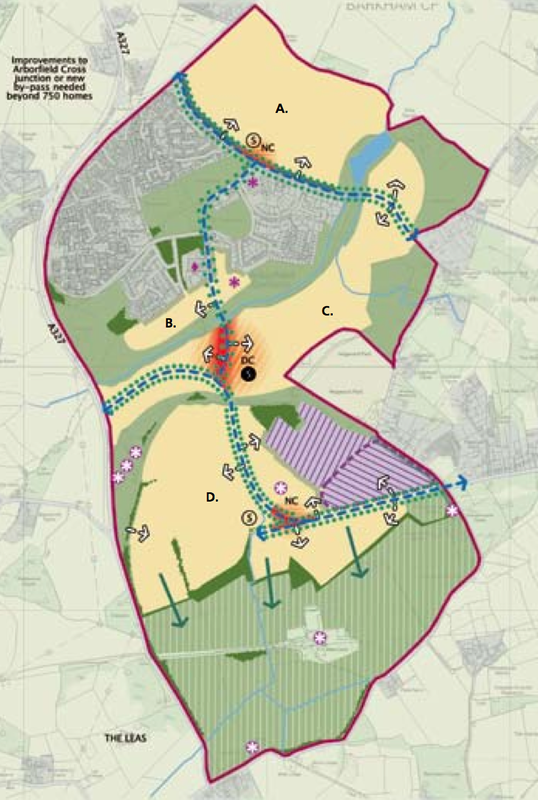 Again to build a “sustainable community” the development includes a doubling in size of the Hogwood Lane Industrial Estate, a large supermarket and community facilities. Major areas of concern remain however, in particular that of transport. The SDL has no railway connections and has major issues over road access caused by bottlenecks on the A327 to the north in Arborfield Village, to the south in Eversley, to the east at Barkham bridge, and to the west to Swallowfield. This has led to Hampshire County Council starting legal proceedings against Wokingham Borough Council over the lack of a transport solution for the road through Eversley. Currently though the SDL has been adopted, a planning application for the site has not been submitted. The council has asked for a single planning application, however one of the landowners has split from the main consortium, and whilst the two groups are talking negotiations between the developers and the council are ongoing.